The dome of the WM Keck Observatory, located atop Mauna Kea on Hawaii’s Big Island, opened just past sunset yesterday for a night of routine observing. 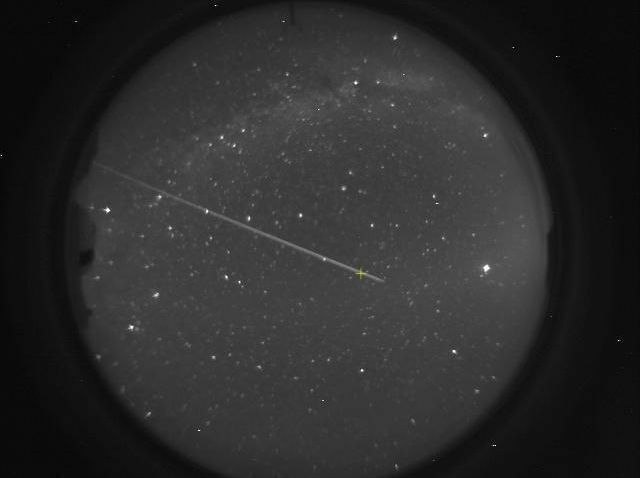 Part of the nightly routine for some Keck astronomers is aiming and shooting a laser beam into night sky. The laser shoots high into earth’s upper atmosphere, creating an artificial star used to help astronomers focus the telescope on regions of the sky where there are few or no bright stars, according to Keck’s website. The laser helps scientists study darker areas of the cosmos. But what impact does the laser have on astronmers observing with different nearby telescopes? Little, according to Adam Burgasser, assistant professor of physics at UCSD (and full disclosure, my partner, over who’s shoulder I peeked while he was observing last night with the UH 2.2-meter telescope). Burgasser could see the Keck laser in his field of view and paid attention to its location using a software program. But most of the celestial objects he planned to observe were located no where near the laser beam, and the laser had no real impact on his work. Still, there is a possible conflict for astronomers wanting to observe an object located in the laser’s path. Those scienists might have to wait until the laser moves before focusing on that part of the sky. (Below) This image of Keck’s laser beam was taken by A Burgasser, who was observing from the neighboring UH 2.2-meter telescope using the all-sky camera at 7:42pm HST in a good clear sky (0″5 seeing). To be clear, the laser wasn’t in the field of view (FOV) of where my telescope was pointed (and by my I mean the NASA Infrared Telescope Facility). However, it was up in the sky and I had a good discussion with my telescope operator Paul Sears as to whether it would have a negative impact on my observations if the beam did cross my FOV. Because I’m working in the infrared (1000-2500 nm), and the laser is a sodium laser (589 nm), he believes it *probably* wouldn’t interfere – although it would mean me and the Keck observer were looking at the same target!